Please note that the content of this book primarily consists of articles available from Wikipedia or other free sources online. 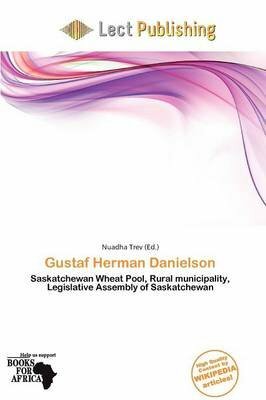 Gustaf Herman Danielson (1883 - July 1971) was a Canadian provincial politician. He was born in Sweden, immigrated to the United States in 1901, and then to Saskatchewan in 1904. In Saskatchewan he homesteaded south of Elbow. He was active in many organizations: he was a Saskatchewan Wheat Pool delegate, served on the board of the Davidson Co-operative Association for more than forty years, was elected to Rural Municipality council for fifteen years, the last eight as reeve, the school board for seven years, and the Davidson Hospital Board for thirty-eight years.